Rodger McPhail, son of a Scottish father and a Lancastrian mother, has always lived in Lancashire. After leaving school he studied for three years at the Liverpool School of Art. In 1975 he travelled to Spain to undertake a series of partridge shooting commissions and in 1977 he made the first of his visits to the US to paint commissions of shooting scenes in South Carolina and Georgia. 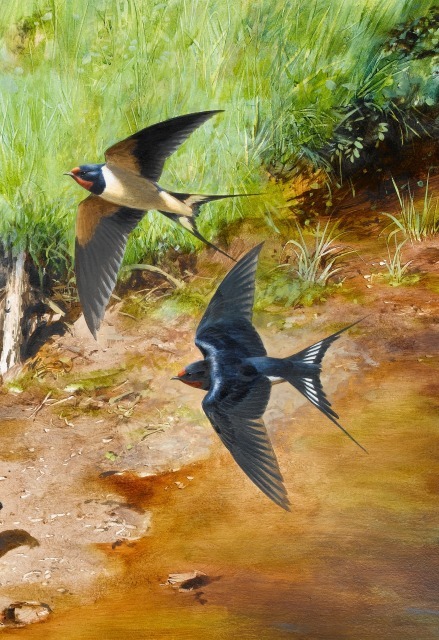 Rodger has for many years been acknowledged as the country's leading sporting and wildlife artist. He is in a class of his own, the automatic first choice for anyone wanting book illustrated, a front cover, or even a postage stamp. He is also a highly competent portraitist and much in demand as a cartoonist. Many of his pictures have been reproduced as limited edition prints and in addition he has illustrated several books. Rodger will modestly say he took to painting because he was no good at anything else. He regards the Dutch artist, Rien Poortvliet, as his greatest mentor and has high regard for the work of the Dane, Bruno Lillefors, and Frank Southgate among many others. Although he makes frequent use of his camera and other references he has a style which is unique. He has the ability to work quickly and accurately with a wonderful photographic memory. Rodger is known across the globe for his illustration on the label of the renowned blended Scotch whisky `Famous Grouse`.